Growing Generous Souls Is Now Out! 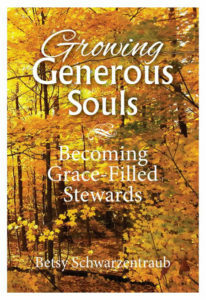 I’m pleased to announce that my new book is now out: Growing Generous Souls: Becoming Grace-Filled Stewards! It invites church leaders and individuals to stop racing from one activity to another and instead to focus on being rather than on compulsive doing and consuming. The book includes reflection questions and resources to help people move toward becoming more faithful, joyful stewards of all that God has provided. Challenging unbridled consumerism and the ethic of scarcity, it reorients stewardship from just another church program to a holistic way of life based on gratitude. The book prompts readers to reconsider their use of money, relationships, and ways of caring for one another and the world as spiritual issues, so they can be passionate in their generosity and become more aligned with what God intended for them all along. Check it out at amazon.com! In addition, growinggeneroussouls.com, the book website, gives a (free) seven-week Small-Group Study Guide, a range of worship aids, an index of people and ministries cited in the book, and other materials for personal and group study. I’m currently working on seven weeks of daily devotions to post there, as well. The aim is to give plenty of supportive materials for individuals and groups to nurture their souls and experience personal spiritual growth. I hope you will find these resources helpful.